Chilled Cucumber Tomato Salad is a refreshing salad made with fresh ingredients that can be enjoyed all year round. It’s fast, easy, and can be made ahead which makes it perfect for potlucks and brunches! Fresh produce is the best thing about spring and summer. And this chilled cucumber tomato salad might just be my favourite way to use it all up. Sometimes simple is best and this salad is the perfect example of that. 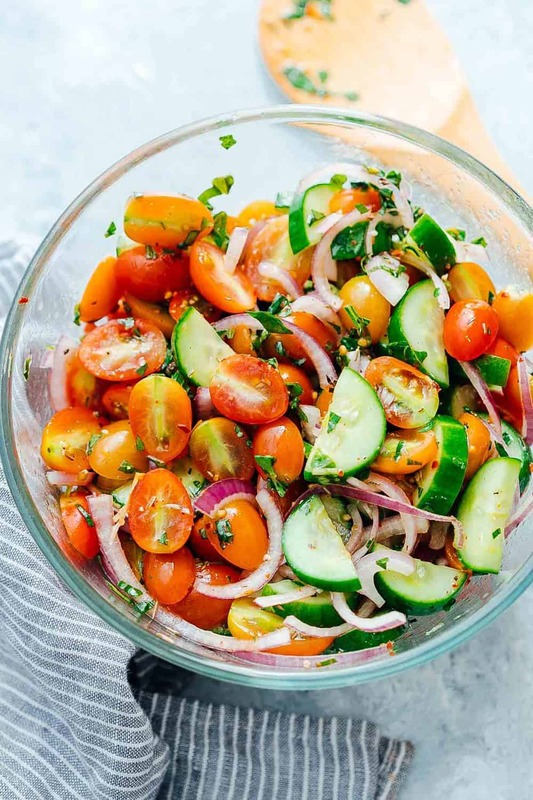 We are using standard pantry ingredients like olive oil, vinegar, chilli flakes, sugar and herbs to create a quick and easy dressing thats sweet and tart, and makes this salad so refreshing in the warm months. If you are one of those lucky ones that have a thriving garden in your background and don’t know what to do with all those tomatoes, I envy you. Because you’ll never tire of using them for this. 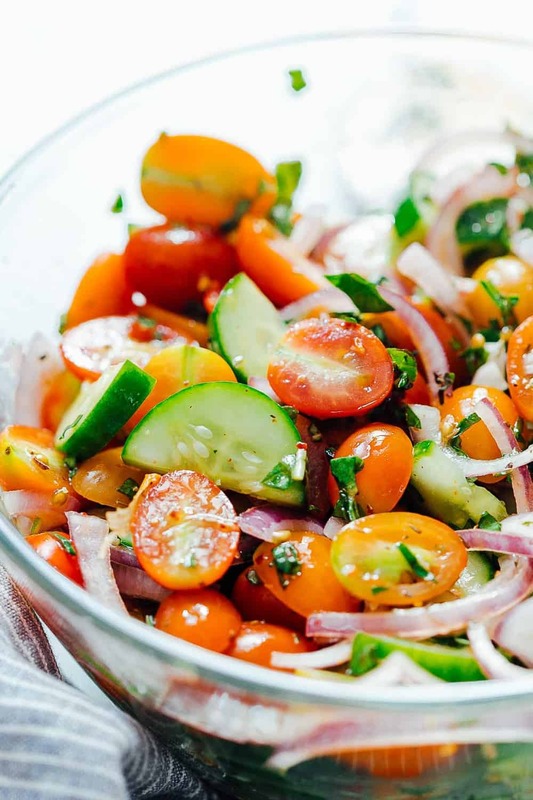 Juice tomatoes, crisp cucumbers and red onions add sweetness, freshness and punch to this super versatile salad. Feel free to swap grape tomatoes for cherry or heirloom. I like to keep the skin on on the cucumbers because it adds so much colour, and saves me some time. We love using red onions and I recommend that you don’t swap them for white. I know that some people think the flavour is too strong, but you can get rid of the bite by soaking them in water for 10-15 minutes before slicing. This retains the flavour but takes away the sting. And when these three combine and soak in that delicious sweet and tart dressing, everything becomes juicy, but stays crisp. And every bite is a burst of flavours. We are using basil and parsley here because basil and tomatoes are a match no one can argue with. But feel free to go with your favourite herbs. I love dill and even thyme works nicely here. But if I’m honest, parsley and basil are my favourites. Can this cucumber tomato salad be made ahead? Absolutely! In fact, I would recommend making this a few hours ahead to let the flavours marry and to let the veggies soak up that delicious dressing so that you can taste it in every bite. 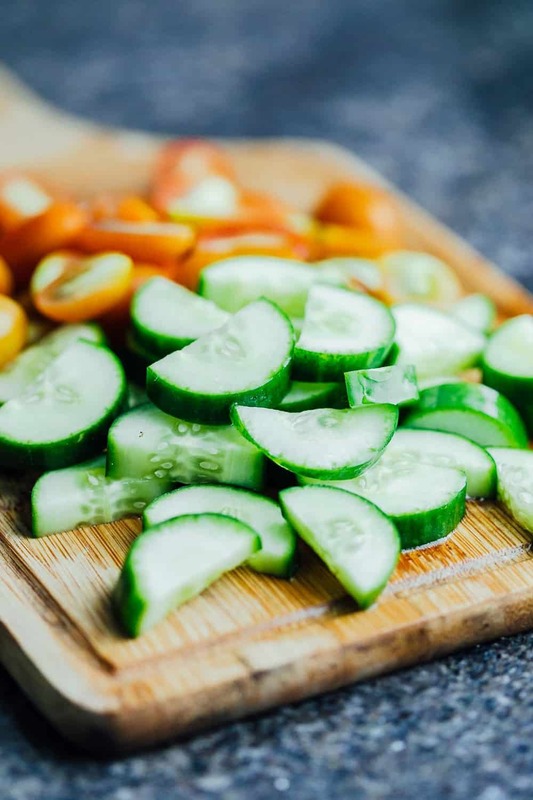 This chilled cucumber tomato salad stays good for at least 24 hours when refrigerated, but I bet it wouldn’t last that long! Chilled Cucumber Tomato Salad is a refreshing salad made with fresh ingredients that can be enjoyed all year round. It's fast, easy, and can be made ahead which makes it perfect for potlucks and brunches! Whisk together all the ingredients for salad dressing. Check for seasoning. Salad dressings should be on the saltier side so that when they are added to the veggies, the flavours balance themselves. Add all the veggies to a large bowl, and toss well with the salad dressing. Refrigerate for at least an hour before serving. Mix again right before serving. I made this salad several times over the summer to take to friend’s house and every time I was asked for the recipe! It’s so good! The only thing I did differently was add mini mozzarella balls to it. Thank you!